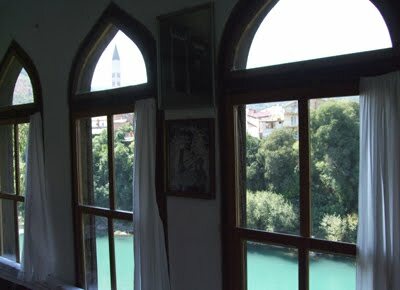 The Biscevic Turkish House, built in 1635, overlooks the Neretva River in Mostar. The Franciscan Church’s spire, the tallest in Mostar, stands across the river. 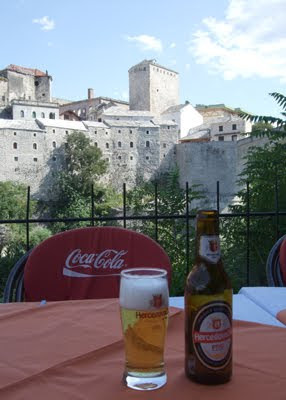 When I was on vacation in September, I visited Mostar, a city in Bosnia-Herzegovina. It has become one of my most memorable travel experiences. Light streams through the windows of a mosque. It is no longer used as a place of worship. Mostar is pretty much the opposite of everything I’m familiar with. It’s really, really (medieval) old. The influence of the Ottoman Empire is everywhere (there are many minarets). It was the site of heavy fighting during the Balkan wars of the early ’90s. To contrast, I grew up in northeast Wisconsin. Any building that is more than 100 years old is really, really old. There are two kinds of religion — Catholic and Lutheran — and the Fox River Valley may be best known for the mall. It was a good, safe place to grow up, and my family still lives there. 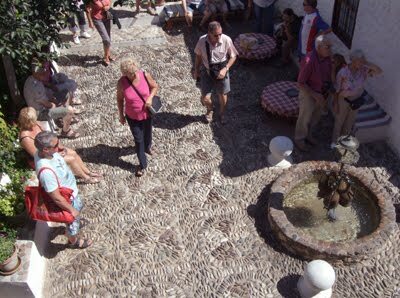 Cobblestones form a pattern in the courtyard of the Turkish House. I didn’t see the design until I looked down on the courtyard from a second-story balcony. A 13-year-old girl in Mostar in 1993 was probably sequestered to her house for fear of getting shot by a sniper. One of Mostar’s greatest traditions is the Divers Club. Young men dive from the Old Bridge for donations. The river is about 75 feet below! 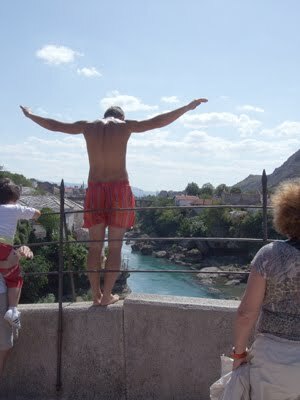 Mostar is most known for its Old Bridge, or Stari Most. 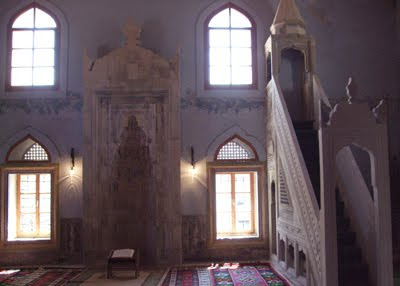 It was built in the 16th century by the Ottoman Empire, and it was a technological marvel of its time. The bridge spans the blue-green Neretva River, and it is considered the point where East meets West in the city. It is made of smooth, white stone, and its proportions are even more elegant in person. The Old Bridge is seen from the Turkish district. The main drag is filled with souvenir stands. The original bridge was destroyed in November 1993. It was shelled from the mountains by Croat (Catholic) forces. The bridge was a strategic and symbolic target. 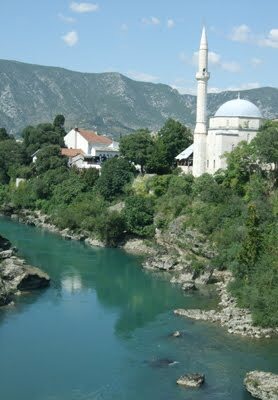 As it crumbled into the river, so did Bosniak (Muslim) connections to the western half of Mostar — and the Bosniaks’ proud icon of their Turkish heritage. Erin sits near the Old Bridge. The bridge is narrow. It’s hard to imagine, but during World War II, German forces drove tanks over the original span. 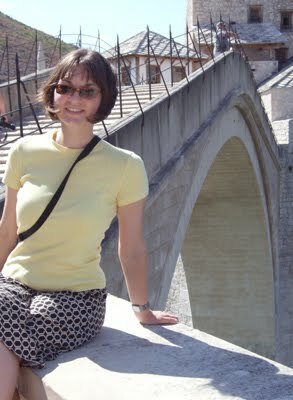 The bridge was rebuilt and inaugurated in 2004, but evidence of the conflict is prominent in Mostar. There are many small monuments engraved with “1993.” The most startling reminders, though, are the many burned-out and bullet-riddled buildings throughout the town. There were many damaged buildings in Mostar that made us ask the same questions: did they run out of money to repair them? For the most part, we think the answer is yes. Unlike Berlin, which left WWII damage alone as memorials, there is not much money in BiH (Ed. note: This is the abbreviation for Bosnia-Herzegovina.) to repair damage from the war for independence. A shelled-out building stands off a main street. 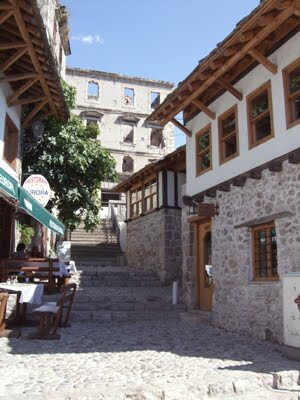 There are many damaged structures in Mostar with “Warning! Dangerous Ruin” signs. It’s a different beast, though, to see a battleground memorial that’s not in the context of current-day affluence. That’s not to say that Mostar is impoverished and gloomy. 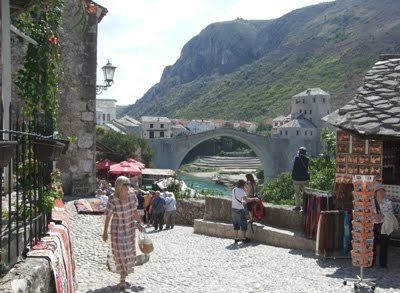 In fact, travel guru Rick Steves predicts that Mostar’s tourism is going to boom in coming years. The Koski Mehmed-Pasha Mosque is a dramatic sight on the blue-green river. Some places have had more time to recover, and others still are recovering. And that made quite an impression on this girl from Appleton who’s had a very secure and blessed life. 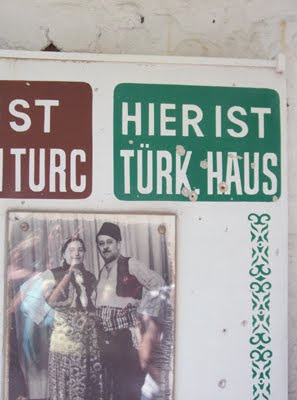 Bullet holes scar the sign of the Biscevic Turkish House. A regional beer accompanies lunch. From our table, we had views of the Turkish section across the river and the Old Bridge (right side of the photo, behind the trees). On my return to VHHQ, I requested a regional cookbook from the library. I whipped up a reasonable facsimile of the East-meets-West cuisine. I hope you enjoy it, too. 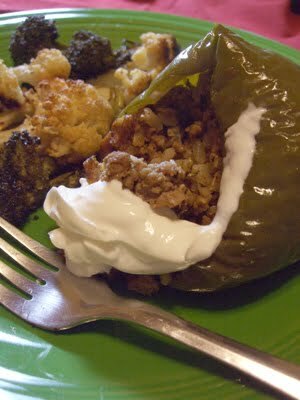 The stuffed peppers are moist and flavorful. This recipe fills four medium peppers. Cut off the top of the peppers, and remove the ribs and seeds. Soak the bread in 1 ounce water. When the water is absorbed, ring out the bread and mix it with the ground meat. Heat half the oil in a skillet and gently sweat the onion until soft. Add the garlic and rice; increase the heat to medium and quickly fry the rice for about 2 minutes. Add 1 ounce water to the skillet, mix well, and add to the meat mixture. Add cilantro and salt to the meat mix and mix all ingredients well. Fill the pepper with the meat mixture. Sprinkle peppers with paprika. Heat the rest of the oil, and lightly fry the peppers on all sides. Place the peppers in an ovenproof covered dish. Add 4 ounces of water or stock to the skillet, and stir in the tomato paste. Add the flour in increments, stirring to keep the sauce smooth. (Don’t worry if it’s a bit lumpy.) Bring the sauce to a boil, and pour over the peppers. The peppers are served with roasted broccoli and cauliflower. 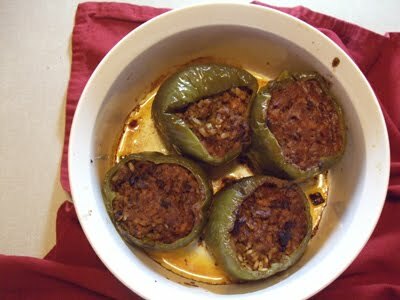 The peppers were great leftovers, and the original recipe says they’re even better left overnight. This could be a good make-ahead recipe.